The concept of brands and branding can be confusing. But getting this right is crucial to your sales success. In this issue, we’ll outline how your brand/story affects your audiences and their purchasing behavior. We’ll give you some simple tests to judge whether your own brand/story is helping or hurting your chances of making the sale. Relax. You don’t have to worry about your life science “brand” anymore! For many scientifically-trained people the marketing concept that causes the most confusion (and that leads to many poor life science marketing decisions) is the concept of the brand. If you are confused, that’s OK. Lots of people are. “Branding” is confusing, and now we are supposed to forget this and focus on “storytelling?” That’s even more confusing.The marketing concept that often causes the most confusion is the concept of the brand. To clear up this confusion, let me connect the concepts underlying the words “brand,” “storytelling,” and “narrative” to your sales success in the life sciences. For connected they most surely are. To understand the connection between your sales success and your “brand” (what I’ll be calling your brand/story) we first need to define some terms. The original brand was a hot iron stamp used to burn a mark into the flesh of animals. This practice can be traced all the way back to the ancient Egyptians. Branding cattle is hard work, it’s painful, it smells bad and it’s permanent.Branding cattle is hard work, it’s painful, it smells bad and it’s permanent. Except for the smell, all these apply to organizational branding. As others have pointed out, with the exception of the smell, these characteristics apply to branding and storytelling in marketing as well: they’re hard work, they’re generally painful (because of the difficult choices involved), and they’re permanent (or they should be). Here is where the confusion starts to creep in. Some people use the word “brand” to refer to the symbol or corporate identity of the organization (think of Quintiles’ big red Q, which we designed in 1989, or of Life Technologies’ script logotype). This definition takes its cue from the “brand” on a cow. And some others claim that a “brand” is what exists in the mind of their audiences, created by all the impressions perceived by these audiences. So there seem to be three definitions. 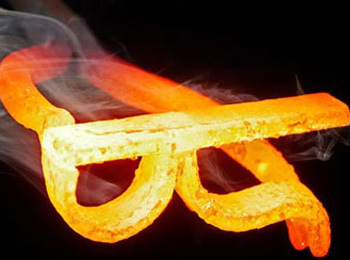 In some uses, the word “brand” refers to a symbol or wordmark. In others the word “brand” is organization-centric. In still others, the word “brand” is audience-centric. For the purposes of this discussion, I’m going to use the nomenclature “brand/story” to refer to the organization-centric idea of choosing traits that deliberately distinguish one organization or offering from another. In contrast, the word “image” will refer to the impression that the audience has of your organization. And the term “corporate identity” will refer to that symbol or wordmark that is the organization’s unique identifier (e.g., Quintiles’ Q). To reiterate, your brand/story is something your organization chooses to differentiate itself, while the image of your brand/story is something your audiences create in their own minds. Your brand/story is the collection of distinguishing personality traits that your organization chooses to communicate to your audiences. These help the audiences build an image in their minds, which influences their purchase behavior. If your marketing is effective at reaching your audiences, the image in their minds will align with the brand/story you’ve chosen. And since the image of your organization in your audiences’ minds helps influence their purchase behavior, your brand/story is important to your sales success. And that is why “branding” is such an important activity and why it continues to be such an important topic in the marketing literature. To understand the differences between brand/story and image, you first have to understand the life sciences marketing ecosystem, which we’ve depicted here in five concentric circles. There are five concentric circles in the life science marketing ecosystem. Your organization is at the center of this ecosystem. Your brand/story is the layer that connects your organization and your touchpoints. The outermost circle represents the environment in which your organization, your competitors and your audiences exist. For example, the sector of CROs, the sector of preclinical labs, or the sector of PCR equipment manufacturers could all be represented by this outermost circle. There are many factors that influence this circle, such as regulations, changing technology, social concerns (e.g., acceptance of genetically modified organisms), etc. These audiences learn about your organization through touchpoints, those areas of contact between your organization and your audiences. Your touchpoints can include physical objects, environments, online experiences and even interactions with people. 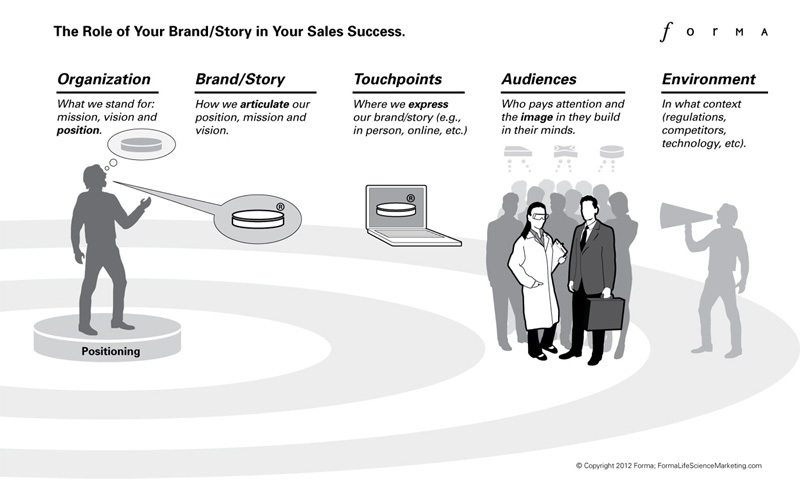 Inside the circle of your touchpoints is the circle of your brand/story. And at the center of this diagram is your organization, with its mission and goals. Again, for the purposes of this discussion, we will assume that you’ve properly set the foundation for future sales success by choosing a value proposition that is truly unique and have encapsulated it in a unique, clear, and authentic position. The ecosystem of your life science organization’s marketing efforts. There are five layers to your organization’s marketing ecosystem: the environment, your audience, your touchpoints, your brand/story and your organization. Your brand story plays a crucial role in articulating your organization’s position. This position affects the image your audiences construct, which affects their buying behavior. As you can see, your brand/story is the layer that connects your touchpoints with your organization. In other words, your brand/story is the connecting link between your internal marketing activities (setting strategy, choosing a position, etc) and your external activities (touchpoints such as your trade shows, your web site and your content marketing). Your brand/story is the translation of your mission/vision and position into verbal, visual and tactile messages that can be clearly understood by your external audiences. Your brand/story is the common element of all your touchpoints. It is the “common denominator” that appears every time you reach out, deliberately or not, to your audiences. From the perspective of your organization, your brand/story is the sum of all the verbal, visual and tactile representations of your organization – that is, what the organization is saying about itself, consciously or unconsciously. As you can imagine, if your organization is not in sync (or “internally aligned”), then different parts of the organization will be sending out inconsistent, mixed messages. These inconsistent messages will confuse your audiences. A confused audience is unlikely to buy. This is why internal alignment and consistency are so important for sales success in life science marketing. Your brand/story is how your unique position is articulated. It is the common element of all your touchpoints. From the perspective of your audience, the organizational personality they perceive will be based on the sum of all the impressions of your organization and its products/services – that is, all the impressions from all your organization’s touchpoints. These impressions will include the touchpoints you control plus all those others that you do not control – for example, customer reviews and statements by regulatory agencies or the trade press. Your audiences will condense all these impressions down into an “image” of your organization that they will then carry around in their head. That’s why getting your brand/story right in the first place and then keeping it consistent are so important; your audience uses all these impressions to create an image of your organization. Make no mistake, the image carried by the audiences in their heads will influence their behavior, both during the investigatory phase (while they’re just shopping) and during the purchase phase. Since the investigatory phase often happens anonymously (thanks to the Internet and the wide availability of information), it is crucially important to get your brand/story right and align it with your internal mission, vision and position. This concept of achieving sales success by getting your brand/story right has some interesting corollaries. For example, search engines (one of your most important audiences) have an image of your organization’s brand/story. They build this image by categorizing your available digital presence and using this to rank your organization in their responses to search queries. And it is these search responses that often guide your human prospects in building a short list of organizations to investigate further. If your organization’s brand/story isn’t on target, then the image gathered by the search engines won’t be right, and you won’t be included in the appropriate search results. You need to get your brand/story right. Your brand/story, if it does nothing else, must clearly convey your organization’s unique position. Articulating your organization’s position is your brand/story’s most important function and the primary reason it exists. Your brand/story enables your audience to understand exactly what you stand for, which assists them in creating an image of your organization or offering in their minds that aligns with the image you want them to have. So your brand/story, if it does nothing else, must clearly convey your position. There are two common flaws when utilizing a brand/story in life science marketing. Flaw One: The brand/story does not adequately articulate the organization’s position. Your brand/story must articulate your organization’s position clearly and your brand/story must be used and applied consistently.Unless your brand/story conveys your position, you will fail to educate your audiences about your unique value. Without a clear statement of your unique value, the image that your audiences will create about your organization will not include your uniqueness. If your organization is not seen as unique, why would they want to buy from you? Flaw two: The brand/story is inconsistent or is used inconsistently across the various touchpoints. If your brand/story is inconsistent, the image that your audience creates in their minds also will be inconsistent. Inconsistent images lead to a confused audience. Confused audiences don’t buy. Simple tests for your brand/story in life science marketing. Crafting effective brand/stories is no trivial task. Much has been written on the topic. But it can be easier to assess the effectiveness of your brand/story. Start by answering the following two questions:Does your brand story clearly communicate your position? It is used consistently? If not, you are missing a huge opportunity to influence your audiences’ view of your organization and increase sales. 1. Does your brand/story clearly communicate your position and your unique value proposition? That is, are your claims stated clearly, in customer-centric language? Are your claims unique? Do the visual, verbal and tactile components of your brand/story align with your organization’s position (which must be clear, unique, authentic, sustainable, important believable and compelling)? If not, it’s likely you are confusing your audiences and missing an opportunity to influence their image of your organization. 2. Is your brand/story consistent across all touchpoints? To determine this, gather a copy of everything that has your corporate identity on it. Print out copies of your web site, your proposals, your invoices, images of your tradeshow booth, email blasts, etc. Let’s go after the low hanging fruit: Do all the colors match? Is your tagline used consistently? Does the body copy for all these items communicate the same point-of-view, make the same claims, stress the same unique value? If not, your audiences are probably already confused about what your organization stands for. Your brand/story contributes directly to the image of your organization that your audiences build in their own minds. That image contributes to their purchase behavior; your brand/story will contribute to (or detract from) your sale success. For this reason alone, you should consider your brand/story an important component of your life science marketing efforts. The concept of a “brand” can be confusing. Your brand/story is the messenger between your position (an internal decision) and your image (constructed externally by your audiences in their own minds by the sum of all their impressions of your organization’s touchpoints). Your brand/story must articulate your organization’s position. Your brand/story must articulate this clearly and consistently. There are some simple tests you can use to determine whether your brand/story is being used consistently, or is articulating your position clearly. Your brand/story influences your audiences’ image of your organization, which influences their buying behaviors. Your brand/story is connected to your sales success (or failure).